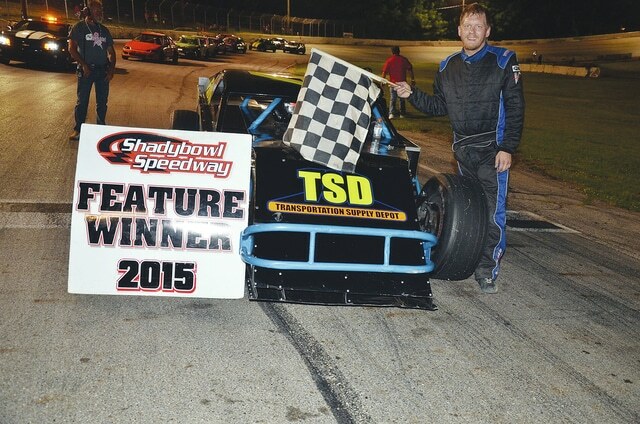 Brad Williams (pictured) won the modified feature at Shady Bowl Saturday night. DeGRAFF – It was a great night of racing for local fans Saturday night at Shady Bowl Speedway. The event was the American Cancer Society Relay for Life fundraiser. In modified action, Columbus driver Shawn Gray jumped out to take the lead. Gray led the first 12 counters before fast qualifier Brad Williams motored by. Williams had his TSD Transportation backed open wheeler dialed in, as he led the rest of the event to post his third win of the season. Mike Carroll was a very competitive second. Logan McPherson was third, with Chad Fiessinger fourth and Anthony Heitzman. Joe Pequignot was the dash winner with Fiessinger and Chris Prater taking heat wins. The street stock feature was a crash-filled event that saw a rash of torn up race cars and hurt feelings. No one was injured in any of the melees. Josh Longstreth led the first 12 laps before Ray Muncy put his Camaro out front. A lap 18 crash saw Jacob Muncy come to rest with his front bumper inside the driver’s side of Mike Snapp’s racer. The veteran driver told officials: “I leaned over as far as I could and his bumper hit me on the arm.” Snapp was able to restart and was the leader when racing resumed. The Springhill resident powered his SRS Monte Carlo all the way to the checkered to notch his second win of the season. Jimmy Hurt finished a strong second, with Mike South third, Jacob Muncy fourth and Dave Little fifth. Chad Brandyberry was the dash victor, with Ray Muncy and Rodney Roush scoring heat wins. Jacob Muncy was fast qualifier. In tuner action, Austin Eaton carried the checkered for the feature win and the dash. Austin was able to hold off his uncle Terry Eaton in a great race. Eddie Kemp finished third to go along with his heat win to notch his best finish of the season. David Callahan and Les Rhodes rounded out the top five. Rodney Roush was fast qualifier. Alex George dominated the compact main to carry the checkered in the feature. He was also the dash winner. George is sponsored by A&B Auto Parts. Larry Adams was second, with Josh Foltz third. Nicholas Meade won the dash to go along with his fourth place finish. Zach Doolin rounded out the top five. Justin Durflinger won the Pure Stock main. This Saturday, Shady Bowl will welcome the Late Models, Modifieds, Street Stocks, Dwarf Cars, Compacts and Pure Stocks. Racing will start at 7 p.m.